While growing up, almost every girl has someone they look up to ranging from advice to inspiration. Whether its your mom or a rad celebrity, having that inspirational woman to look up to is fundamental because they provide you with motivation to keep pushing forward while reaching you’re ultimate dreams. Initially when I created this blog I simply wanted to track my journey on achieving my dreams of having a career in the fashion industry. My feel for the blog has of course changed since then but I believe the ultimate beauty in achieving your dreams is also being able to provide other individuals to learn from your story and path. So in a very Fashilluminous-esque fashion, during the month of March I’ll be providing you all with some FashInspo from GirlBosses around the United States who are slaying in their careers. 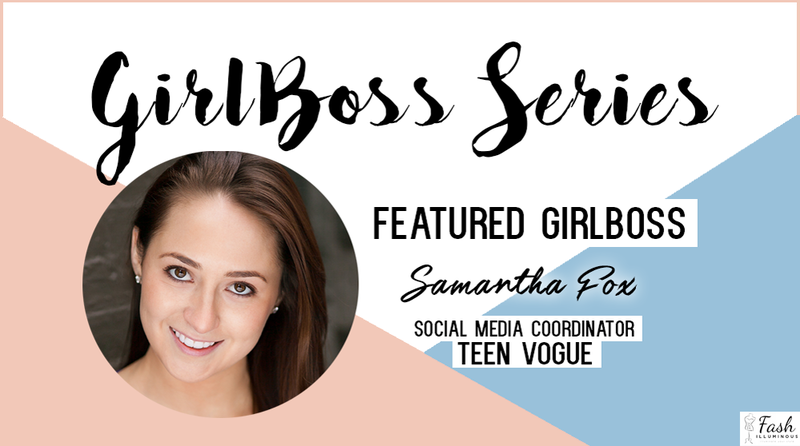 Our first GirlBoss will be the awesome Sam Fox, Social Media Coordinator from Teen Vogue! Read below to learn more about Sam and how she is a GirlBoss. How did you get involved in the creative digital world? When I was the Editor-in-Chief of my high school paper, the online world wasn’t quite as developed as it is now. Our paper was print-only until my senior year when it transferred into an online news site. That’s when I first learned how creative I could get with a digital outlet. When I went to college, I started writing a blog called “That Was Awkward” in which I over-analyzed embarrassing yet all-too-common social encounters. While I assumed nobody would read my incessant rambles, The editor of our Her Campus chapter asked me to bring my blog to the site, and I ended up becoming the Her Campus Features Editor! It wasn’t until I graduated college and took a job at AOL that I fell in love with social media as a means to creatively promote editorial content. What is a typical day for you working at Teen Vogue as a Social Media Coordinator? I handle all social media for the integrated marketing team here at Teen Vogue, so my job entails two main tasks: running our @TeenVogueItGirls social media handles and working with social media influencers for various campaigns. I spend the majority of my day stalking up-and-coming YouTube stars and beauty bloggers on Instagram to decide how we might work with them on different programs, posting Teen Vogue articles on our social media channels, interacting with our AMAZING panel of IT GIRLS to plan various events and opportunities, and coming up with exciting new ways to utilize social media for marketing purposes! What advice can you give to fashion industry hopefuls? Play to your strengths and stay very open-minded. It’s an extremely small industry so you can’t assume that there’ll be an opening for that life-long-dream job exactly when you want it. Instead, see if there’s an opening in a field within the industry that might interest you even if it’s not what you always imagined doing. I always planned to be a writer, and somehow I ended up working in social media on a marketing team. I’m still not exactly sure how I got here, but I’m so glad I did. I love that I’m acquiring new strengths and learning every aspect that goes into making a magazine. I wouldn’t trade this experience for anything. Also, when you land a job in the industry (which you will as long as you work for it! ), remember to appreciate the opportunity. It’s a bustling atmosphere and sometimes you can get very stressed and frustrated, but at the end of the day you have to remember why you’re there and how lucky you are to be there. Let that passion for what you do and appreciation for your position fuel you. I just graduated college in May so the whole career thing is still fairly new to me, but seeing my name in print for the first time in our December issue was definitely a really cool moment! Who is your inspirational GirlBoss? A year ago I would’ve said hands down my college English thesis advisor because she’s so smart and badass and I’m a huge nerd who wants to grow up to be just like her. While I’m still obsessed with my thesis advisor, after working at Teen Vogue for the past few months and becoming exposed to the words and actions some seriously talented and brilliant women in Hollywood, there’s no way I could pick just one inspirational GirlBoss. Emma Watson, Zoe Kravitz, Amandla Stenberg, Rowan Blanchard, Lady Gaga, Gina Rodriguez, Lupita Nyong’o and more are all lending their voices to causes they believe in and empowering their young fans. They’re successful, talented, and use their platforms to ignite change and make people aware of important conversations. What makes you a GirlBoss? In my eyes, any girl who refuses to accept less than her full potential and actively pursues her dream is a total GirlBoss. It’s so important to be humble and to never act overly entitled in this industry, but it’s equally important to prove your worth. It’s still so surreal to me that I’m actually living in New York City and working at my dream publication, so I push myself to achieve GirlBoss status every day and to never take this insane opportunity for granted. As stated by #GIRLBOSS movement creator and founder of NastyGal.com, Sophia Amoruso, “You create the world, blink by blink. It is entirely yours to discover and yours to create.” It was great speaking to Sam (she is totally a GirlBoss) and we wish her well in all of her future endeavors!